Kyra Turner is a freshman from Memphis, Tenn. who plans to major in business administration and communications. Kyra Turner is a freshman from Memphis, Tenn. who plans to major in business administration and communications. She is a player on the women’s lacrosse team and loves to do makeup in her free time. Purple and White: What made you come to Millsaps? Kyra Turner: The small class size. When I had my tour, my tour guide made it seem like Millsaps was fun. P&W: What’s your favorite part of campus? KT: Area wise? I’d say the library because I can study there, and I get a lot of work done whenever I go in there. 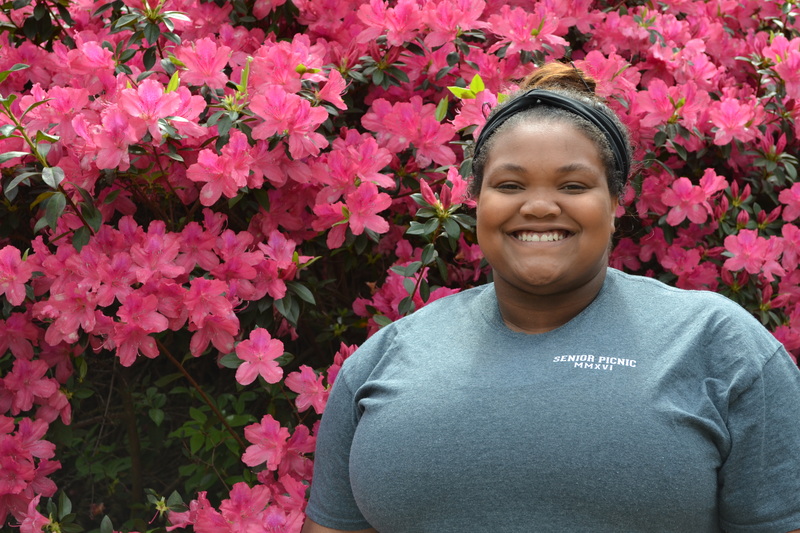 P&W: How have you changed as a person since coming to Millsaps? KT: I’m more athletic because I have to walk up and down hills and up and down stairs. I’m more of a team player now that I’ve played a sport. I’m used to playing individual sports, and I’m used to being alone because I’m an only child. P&W: What organizations are you involved in on campus? KT: Women’s Lacrosse. I’m the Marketing and Public Relations Coordinator for PAC (Programs and Activities Council). I’m the Business Manager for Bobshela, which is the yearbook. I’m in BSU (Black Student Union). I’m in Millsaps Retention Advocates, and I think that’s it. KT: Save the Last Dance. P&W: Well, what is your strongest personal quality? KT: Strongest quality…I guess I’d say I’m determined because I don’t like to give up on things. I try to give my all in anything that I do. P&W: If you could travel anywhere, where would you go and why? KT: This is going to be really shallow… but probably France because of the shopping and the culture there. P&W: Anything in particular about the culture? KT: Just the way people are. They’re kind of like one unit in France. America is like all these different groups and how we classify each other…and they’re just French. P&W: Tell me about your most embarrassing moment. P&W: At any point in your life. KT: Okay, so it was my junior year in high school. There’s this guy that I was dating, and he took my phone. I ran down the hall and did a split, and my pants burst open. I couldn’t walk for two days afterwards. P&W: So how’d you go to school? KT: I didn’t. I was in the hospital. P&W: How do you improve your mood when you’re feeling down? KT: To be honest, I’m never down. I don’t let things get to me that I can’t control. P&W: What is your ultimate life goal? KT: To be successful and I want to be able to take care of my family and for my grandma to see me graduate. P&W: Where do you see yourself immediately after graduating Millsaps? KT: Hopefully a Job. I see myself still in Jackson, maybe working in Human Resources of some department. I would actually love to work for Millsaps if I had the opportunity. The Purple and White thanks Kyra for answering these questions! If you or someone you know would like to be featured in the next “Meet the Millsapian” article, email me at clevecd@millsaps.edu.